Duff McKagan's bass-playing resume is as impressive as they come. Not only is he a fully paid-up member of Velvet Revolver, he was one fifth of the 'classic' Guns N' Roses line-up. Fans of Appetite For Destruction will know that this fact alone deserves some serious respect. McKagan survived 13 years of GN'R, before quitting in 1998, a few years after his pancreas exploded due to acute alcohol and drug-induced pancreatitis. On a lighter note, not many people could claim that their profanity-filled acceptance speech forced all future 'live' awards shows to be broadcast with a delay. 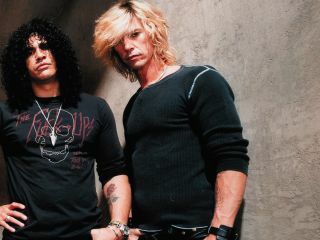 You can watch a video of Duff and Slash making history while collecting the gong for Favourite Heavy Metal Band at the American Music Awards in 1990. Simply add one to the comments below (you'll have to be registered and logged in to do so). We'll pick the best and ask them during the interview.